Jenny Frost has insisted that there is no chance of an Atomic Kitten reunion including Kerry Katona. Despite rumours circulating about a full reformation for the girl group, Frost has said she would never become involved in such a move. "I read that we're supposed to be getting back together with Kerry," she told Closer. "But I'd rather eat my own kidney with a spoon! "Atomic Kitten released three studio albums and scored 13 top ten hits between 1999 and 2005. After Frost joined the band, they reached number one three times with 'Whole Again', 'Eternal Flame', and 'The Tide Is High'. 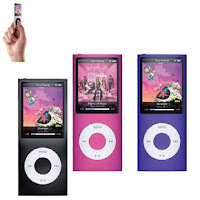 Listen to all your favourite tracks on a new ipod nano from only £109.99! Visit the 24ace website for more fantastic offers! !